What Makes for a Good HVAC Installation? But what do we mean by a good installation? “Good” is tricky to pin down, and HVAC systems are supposed to be precise. What counts as a good installation? How do you make sure you have one? We’ll break down what goes into a good HVAC system installation. This is always the start of an even halfway decent HVAC installation. Unless your installation involves nothing more than putting in an AC window unit (not an effective or efficient method of cooling a house), it must have a licensed professional on the job. Only professionals have the training and the tools, as well as access to the best new units, to see the installation is done correctly. “Sizing” a new HVAC system sometimes confuses homeowners, since it sounds like finding out if the new unit will actually fit in the available space. That’s important, obviously, but one of the simpler tasks. But actual “sizing” is finding out how much heating/cooling output the new system must have to provide comfort to the house without wasting energy. It’s key for sizing to see that the HVAC system is neither underpowered or overpowered, since both mean wasted energy and poor performance. A bad HVAC installation often puts in an oversized system, figuring “you can’t have too much comfort!” But this is wrong, and an oversized system will turn into an energy gobbling nightmare. 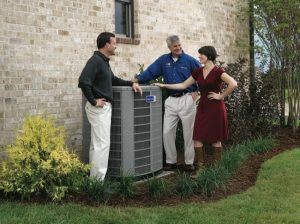 An HVAC professional knows how to measure the comfort needs of the house and then match the new system to those needs. A new heater or AC can’t simply be jammed in and hooked up to some ducts haphazardly. Proper venting is essential to allow for airflow and the removal of heated air from the house (in the case of an AC) or exhaust fumes (for a gas-powered heater). Bad venting is extremely common for amateur installations. The best-case scenario is a system draining excess power for reduced comfort. The worst-case scenario is a system that’s dangerous. Yes, even gas furnaces use electricity! It’s vital that an installation is connected properly to the electrical system of the home so that it won’t cause circuit breakers to trip. Voltage mismatches and shoddy wiring can make turning on the AC the same as just shutting off all the lights in the house. A manufacturer’s warranty on an HVAC system will only be in force if the work was done accurately by licensed technicians. A good installation is one that makes sure the warranty will protect you in case of a manufacturer’s fault. To arrange for the best possible HVAC installation in Beverly Hills, CA or elsewhere in our service area. Kilowatt Heating, Air Conditioning and Electrical has served Los Angeles and the San Fernando Valley since 1990. Schedule a new installation with us today. Don’t Let Your Gas Furnace Get Too Old!